We all love to save time and especially when we're cleaning. As we learn how to keep a home over the years, we develop shortcuts or time-savers in our cleaning. 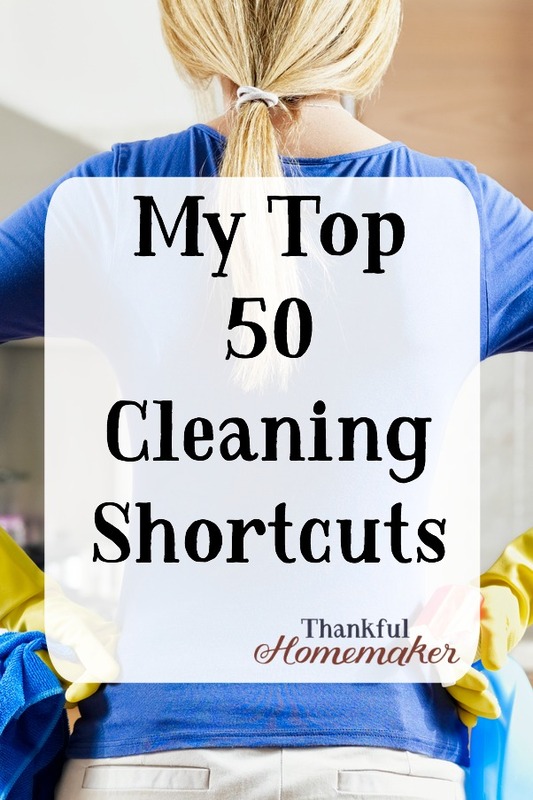 One way we do this is through our daily routines, but how many of us also learned that as a new housewife we spent more time cleaning things that didn't need to be cleaned just because we thought we had to. We don't have to clean the whole mirror each time but just wipe it where it's needed. We don't need to mop the whole floor but spot mop the areas that have the most traffic. Some of my shortcuts come from using various time-saving products that have become staples here in my home. Most are just simple tasks learned over time. Many of these are probably not new to you, but the hope is you'll pick up a time-saver or two. The links are there for an example. Some of the items I purchase locally but a few I do order online. There are some are affiliate links that don't cost you more if you end up making a purchase through them, but they help me to cover costs here at the blog. So thank you in advance. 1.I hold to “don't clean it if it's not dirty”. When I vacuum, mop or wipe mirrors I don't always clean the whole area. It will get done eventually but not every time. 2. I utilize parchment paper on my cookie sheets when baking so I don't have to wash the cookie sheets. With a quick wipe, they are back ready to use again. I buy my parchment paper at Costco and at my store it seems to be a seasonal item (Christmas time) so I try to stock up when it comes in. 3. Swiffer products are a help in my cleaning. I use the dry cloths for quick pickups of hair in the bathroom (I travel with them to tidy our bathrooms from my hair everywhere on the floor too). I like the Swiffer 360 dusters instead of a feather duster for a quick tidy. 4. Clean up messes when they happen. If there's a splatter in the microwave, clean it up immediately or a spill on the floor or carpet. If something has hardened in the microwave already, just heat some water and vinegar in a bowl or mug for about 3 minutes on high and let it sit in the microwave for a bit and then easily wipe the spill. 5. Keep cleaning supplies under every bathroom sink and under the kitchen sink. It helps to not have to carry supplies from room to room. 6. I rarely iron a tablecloth. I like to fluff them in the dryer before putting them on the table if they're a little wrinkled from being folded. This is a great wrinkle reducer with many of your clothing items too. 7. Save on laundry and re-wear clothes that really aren't dirty. Taking the time to put them away properly helps save on extra laundry. We re-wear clothes and if that pair of jeans needs “refreshed” I just give them a fluff in the dryer. 8. I change bed sheets every two weeks because we shower almost daily. I take them off wash, dry and put them back on the bed the same day. I avoid folding this way ;). 9. Re-use your bath towels. We re-use bath towels for a week and just have a place to keep them hung after each use. Make sure each family member has a place to hang their towel. I change hand towels every couple days. 10. The microwave is a help in disinfecting your kitchen sponge. I just toss it in their damp for 30 seconds. 11. Use your dishwasher to wash items that need disinfecting. Items like baby toys that spend time in their mouths, pacifiers, hairbrushes (remove all hair first), glass domes on removable light fixtures, oven hood vents, toothbrush holders and whatever else you think could use a good disinfecting without having to handwash it. 12. Keep the bottom of your oven lined with heavy-duty foil for quick clean ups when spills happen. 13. Clean the kitchen sink with dish soap and a sponge. After finishing dishes for the evening I just take my sponge and a bit of dish soap and clean the sink down. It takes a minute and keeps the sink looking great. I tend to do this after every meal clean up since my sponge usually is ready to go with dish soap on it already. 14. Vinegar is a great help in disinfecting the dishwasher and washing machine. I throw one to two cups in a cycle with no dishes or clothes in it maybe monthly or when needed.I buy my white vinegar at Costco. 15. Garbage disposals clean quickly with ice cubes and lemon or orange peels. When you're eating an orange or slicing a lemon take a moment to give it a quick clean. Turn the water on, toss a few ice cubes, peels and run the disposal. 16. Keep a broom by your front porch. It is a help to keep the front entryway clean so when visitors come in their shoes are clean and not tracking in dirt from the front walk. Keep a good mat by the front door too and an entry rug on the inside to catch dampness off shoes. We don't wear shoes in our house but we always give guests the option to keep their shoes on (most tend to remove them). We have a bench near the front door to make it easier. I wear a pair of tennis shoes that I've designated as inside shoe side tennis shoes that I love instead of slippers. 17. I keep baby wipes near the kitchen table for quick wipe ups of the grandbabies after meals. I love baby wipes. The unscented ones are useful for so many things. Unscented baby wipes work well on your stainless steel appliance fronts too. 18. Clean the bathroom while bathing littles. This has been such a help over the years. I still do it with the grandbabies when I have them here. I utilize my 5 Minute Bathroom Tidy here. 19. Clean your toilets overnight. Use toilet cleaner or baking soda and give it a swish and let it sit overnight and then flush it in the morning. 20. Keep a vacuum on each level if your budget permits. I have a central vacuum system and use it for my cleaning but for quick vacuums upstairs it's been so helpful to have a cheaper vacuum on hand. It's also a help if one breaks too. 21. Keep extra garbage bags in the bottom of your kitchen can. 22. Use your blow dryer to dust houseplants and other hard to reach or dust places. 23. Keep lint rollers on hand for quick pet hair cleanups on you or furniture. 24. Get rid of the mop and bucket and get a good microfiber mop. The sh-mop has been my friend for many years. I love it! So simple and quick to use. You just dampen the microfiber or terry cloth cover and spritz with cleaner or I personally love the Method Floor Cleaners. 25. An old pillowcase makes a great ceiling fan blade cleaner. The dust will fall into the pillowcase instead of the floor. Spray cleaner on the inside of the case, wipe the blades into the pillowcase. 26. Keep a squeegee in the shower. Encourage the last person to shower in the morning to wipe down the walls and glass with it. 27. Cleaning baseboards have been a cinch with this handy tool. Your vacuum's duster attachment is a help with this too and you can attach it to a pole on our vacuum so you're not bending over. 28. Clean your rings with an old toothbrush and mild dish detergent. Most jewelers clean them for free if you're out running errands near one too. 29. Throw your stove grates, knobs and drip pans in the dishwasher for easy cleaning. 30. Keep an all-in-one glass and surface cleaner in the bathroom with paper towels on hand for quick clean-ups. 31. Keep see-through storage bins in the closet for hats, gloves, and scarves. If you have room give each family member their own bin. 32. Teach family members as soon as they can to use a hamper and to sort their own clothes. Keep a hamper in each room. When their hamper is filled, have them deliver it to the laundry room and have three baskets labeled: Darks, lights, and towels to have them to sort into. 33. Change your furnace filter on a schedule. You can save a lot of dusting by putting this one on your calendar when it's time for a filter change. The usual recommended time is three months but check with your manufacturer. 34. Let cleaning solutions soak for a messy job. Soak yucky pots overnight and leave cleaning solution on your cooktop or counter for at least 30 minutes before cleaning up a messy dried on spill. If the spill happened before dinner I leave it to soak while we're eating so cleanup can be done in one step. 35. Clean the shower while you're inside it. Keep a sponge and safe cleaning solution inside your shower for a quick two minute clean up when needed. We've switched all our shower heads to hand held options to make this even easier. 36. Wash your shower curtain liner in the washing machine. Using a cloth shower curtain liner has been a great option too. 37. Wash your blender with warm/hot water and a squirt of dish soap. Just turn it on for a bit (my Vitamix has a cleaning cycle for this option), rinse and you're done. You can this by hand with your shaker bottles too. 38. Spritz vodka on your mattresses or furniture. Alcohol kills odor-causing bacteria instead of masking it. Don't saturate the item but spritz it and let it air dry. If you're an essential oil lover add a few drops of your favorite oils for a fresh smell too. 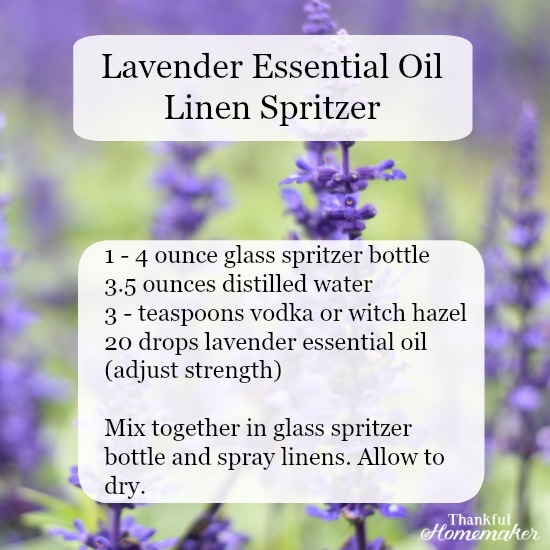 I love lavender essential oil in the bedroom to spritz on the sheets before bed. My simple recipe is below and I use these glass spritzer bottles (the alcohol or witch hazel helps to deter bacterial overgrowth). Give the sheets a spritz and let them air dry before getting in. Download my FREE eBook, A Beginner's Guide to Assembling a Natural Medicine Cabinet here. If you already subscribe to the blog the book is at the bottom of each blog post you receive from Thankful Homemaker in your inbox. 39. Clean from top to bottom (dust falls) and start in one corner of the room and work your way around. This way you won't get distracted, and you'll work through it quickly and efficiently. Vacuum and mop floors last. Kids love to dust. Put an old fluffy sock on their little hands and let them have at it. My grandkids love when I give them Swiffer cloths to help Nana dust :). 40. Spend 15 minutes a day cleaning, and you'll never be in a big mess. If you do a little bit every day, you'll see a big difference in how much time you have to spend cleaning. 41. Make de-cluttering part of your week. Whether it is to toss or giveaway or find a better location for it your home keep working through the clutter. Removing clutter makes keeping order so much easier. 42. Establish routines to help you keep order. My mind goes to morning and evening routines, but you can have routines for meal prep and clean-up, morning or afternoon chore time with kids, or kids bedtime routines. These routines become habits over time and just naturally help you to keep tidy in a jiffy. 43. Make good use of the duster and upholstery attachments on your vacuum. I use mine for everything from baseboards, lampshades, the piano interior, picture frames, window treatments and just dusting furniture. Along with it use the upholstery attachment to give your furniture a quick clean up too. Then see item #38 and freshen it up. 44. Don't get out the mop unless you're mopping a large area. For a small floor clean up, just take microfiber rag, dampen it, add a bit of cleaner if you'd like and wipe up the area that needs it. I do a lot of cleaning with just water. I do love Norwex products for this. 45. Matches make a great bathroom deodorizer. (Note: Use and store with caution with small kids in the house.) Just light the match, put it out and flush it in the toilet. This one came from my grandmother. 46. Use your blow dryer to remove those pesky stickers on items. Warm up the glue with the dryer, and they're a cinch to remove. 47. Mr. Clean Magic Eraser is a must to have on hand especially with small children. I use mine for floor scuffs, marks on the wall, cleaning sneakers, scuff marks on suede and my white kitchen garbage can but there are tons of other uses. 48. Having a good cleaning schedule in place is the biggest time save for me. Check out my podcast and post on my cleaning schedule. 49. Remove bathroom hair in the sink with these handy drain snake clog removers. I have long hair, and my sink gets clogged quickly, so I keep a package of these on hand. 50. Use your dryer to fluff and dust pillows. Toss in a couple of wool dryer balls with them. Obviously, not an exhaustive list but I do have a few closing thought before I end this post. Always tidy first before cleaning. Make sure you have the right tools on hand and put aside funds as your budget permits to purchase products and tools that simplify your home keeping if you can. Invest in multi-purpose cleaners and always work to declutter before you organize. Take the time to organize over time and have some sort of a cleaning system in place. A home that has order is so much easier and quicker to clean. Please share with us. What are some of your favorite time-saving cleaning shortcuts? I also wash sheets every 2 weeks, but in the summer, tend to wash just the pillowcases every 4-5 days. The freshness is nice to sleep on.